Leverages up to 600 pounds of pressure. Stainless steel cone and funnel. All chrome, 7 1/2 inches high, 4 1/2 pounds. MSRP $59 Based on the Manufacturer's Suggested Retail Price, this juicer is less expensive than average and is priced in the bottom 18% of juicers. 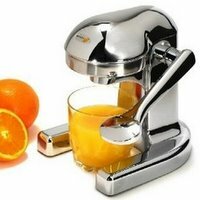 Star Rating 2.4 User reviews, ratings, and feedback indicates that this juicer is rated lower than average by 39 users and ranks in the bottom 4% of juicers.